In March of 2005, an explosion at a Texas City BP oil refinery (the third largest in the United States) killed 15 workers, injured another 180 and severely damaged the plant. The explosion occurred when a distillation tower flooded with hydrocarbons and became over pressurized. Though not directly caused by a piping failure, it was largely the result of improper safety procedures and red flags over the preceding decade, including: Broken alarms Broken gauges Overly thinned pipe Five managers over a six year span A critical component of plant safety, which could help prevent the next failure, is to learn how to maintain and inspect the piping system as part of a comprehensive process safety management (PSM) program. Properly implemented programs help prevent events like the catastrophic Texas City refinery explosion. This post was originally published in August of 2017, and has been updated with more information and resources, including a video comparison burst test. 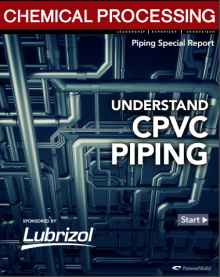 Since its introduction to the market in 1959 by The Lubrizol Corporation, chlorinated polyvinyl chloride (CPVC) has proven to be an attractive alternative to traditional industrial metallic piping systems for a variety of chemical process environments. CPVC is inert to most mineral acids, bases, salts and aliphatic hydrocarbons, which eliminates corrosion and scaling concerns. In addition, CPVC offers high impact resistance, pressure capabilities and heat distortion temperature (HDT), making it ideal for harsh industrial applications. By choosing CPVC material, industrial processes can improve their piping system's service life, lower maintenance costs and reduce downtime. But it is important to note, not all CPVC offers the same level of performance, and CPVC should not be confused with the limited capabilities of polyvinyl chloride (PVC) piping.